Celebrate the Holidays on Lookout Mountain and Chattanooga! Celebrate 24 years of fun at Rock City's premier holiday event, The Enchanted Garden of Lights --- where Joy, Wonder, and Magic await! Warm your heart during this nighttime, family tradition as you walk through Rock City Gardens' winter wonderland. Immerse yourself in this award-winning holiday lighting spectacular, where you can enjoy live music, holiday treats like gingerbread cookies and hot cocoa, and delight at our magical decorations. All but a few reasons to SEE ROCK CITY this holiday season. Voted Best Christmas Lights in Chattanooga! Experience the magic of four uniquely themed realms of wonder: The Magic Forest, Arctic Kingdom, North Pole Village and Yule Town. Start at the Heart by taking a stroll along the North Pole Highway and choose which realm to start your journey. Wander to Yule Town and begin your holiday adventure with a former Enchanted Garden of Lights traditional start, or visit Santa in the North Pole Village first --- the adventure is yours to create! Chattanooga's most whimsical Christmas adventure! 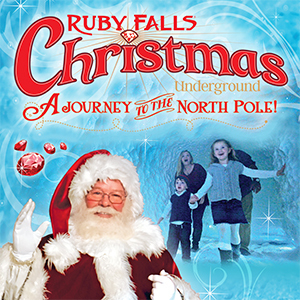 Experience the wonder of Ruby Falls Christmas Underground on a magical, interactive journey to visit Santa! Travel a secret passage to the North Pole where Santa's Joystone miners are preparing for the holiday season. Discover a glittering ice cave, see Sugar Plum Fairy Village, and find your own sparkling Joystone on this heart-warming adventure! Located in the caverns of Ruby Falls, Christmas Underground allows guests to enjoy the nighttime magic throughout the day.